Thank you to everyone who made the tenth Nick's Marathon our biggest yet! 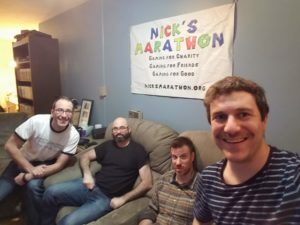 Nick's Marathon is a charitable non-profit that seeks to help sick children and their families. We raise money while playing video games - live on the net - in the memory of Nicholas Capobianco, who lost his battle with leukemia in 2008.